With the advent of Christ, the History completely changes and together with it mankind and its destiny. The philologist Erich Auerbach (whose work I have briefly analyzed) explains that we could find a new idea of God in the Christian literature, a spirit made man, and – closely related to this – a new idea of man, flesh created as an image of God. Each man is an image of the image of God, namely Christ. Looking for his real face, each man seeks the face of Christ; looking for the face of God, men find themselves. If every man’s destiny tends to be divine, the destiny of the divine is to become human. This means that the theme of man’s identity can not be separated from the reflection on Christ. Jesus, depicted in a thousand of different ways through the art history, finds His seal in the iconography of the Cross, a symbol of His supreme sacrifice universally recognizable, but also and above all a symbol of the Salvation, given to men through the Resurrection and the New Alliance. Raffaele Cioffi at the beginning of 2013, decided to face a series of works dedicated to the Cross. A real challenge for this artist who has been devoting to a research related to abstraction for years, defining himself as the heir of Spatialism and of the Analytical Painting. His master of the past is Lucio Fontana, his closest teachers are Claudio Olivieri and Mario Raciti. Figuration appears unrelated to his pictorial path, as well as the shape has been abandoned for a longtime. Nevertheless the desire to confront himself with the symbol of symbols is so strong that the artist adapts his language to the challenge and contaminates it with a renewed experimentalism. 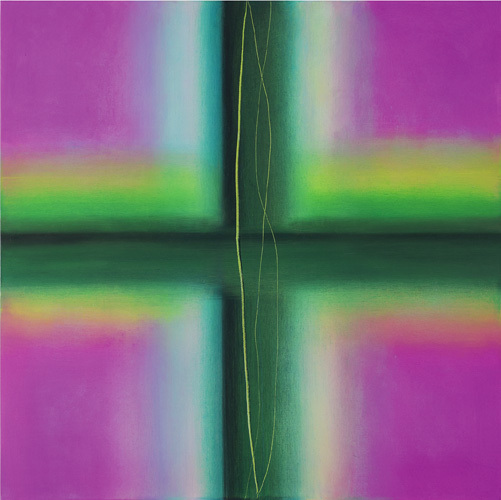 Cioffi’s painting has always been steeped in spirituality and the new theme does not differ too much in contents rather than in its formal study. The artist, in fact, hides the gesture of his brushwork, as if he wanted to cancel his presence. The colors follow vertical and upward lines, because he tends to the higher and to metaphysical spheres and without delay, leaving behind the horizontality of the earth and of human concerns. A light painting, almost impalpable and thin, made of transparencies and shades, which suggests a sense of suspension and the dimension of the eternal. The reference to the sacred theme seems to allude to the masterpieces of Mark Rothko, Barnet Newman, David Simpson, all painters who aspire to infinity in their works through their iridescent shades. Raffaele Cioffi entitles his new work In the light of the Cross, as this symbol is made by light. The light draws the Cross, through the brilliance of colors: incandescent and bold yellow, electric green, shocking pink, iridescent purple and blue. These colors, now airy then more contrasted, express the state of mind and feelings: the Cross is conceived as an image of hope and new life. Only in rare cases a few darker shades allude to a higher thrill. Sometimes the Cross is engraved: these signs, like open wounds, recall the suffering. By opposing themselves to the smooth and spiritual paint, they run through the surface of the light in a strident way, as if they were one body that witnesses the temporality. On some occasions, the colors are more dramatic and mushy: they were laid with a spatula and for this reason they have the weight and volume of the pain. Anguished black and red that recall our inner depths. The palette also makes itself medieval, thank to the use of gold and brown. Refined works allow us to feel the pulse of color, the rhythm and the movement of the pictorial gesture, as if it wanted to remind the pointillist technique. Thank to the works of large dimensions, the Cross is described not only by the flashes of light but also by the shaped and composed canvases. This is then an apotheosis: the exaltation of the Cross in an explosion of colors celebrating the hope, while, in an other way, it seems to counter it. The works on Crucifixion, on the other hand, show Christ’s stylized body. Silhouetted in the red, sometimes darker and then glowing as the blood of the Passion, this body is a dark shadow, which reminds us of the sacrifice of redemption offered by the Son, in the bright blaze of the Cross. Once again, the future destiny of mankind in the glory of the Father prevails in Cioffi’s pictorial metaphor, a perfect icon of hope.